It was an unseasonably warm day in early October 2011, the thermometers just touching eighty degrees in the balmy rolling landscape of north Norfolk. As I cycled along the lane from Aldborough, I cast my mind back to the first time I had come this way, more than six years before. That was in high summer, but I remembered the wind the first time, its blustery getting up, its flurrying the high grasses. Now in October the air above me was deep blue and hazy, but back then the clouds had frowned and scuttered in the wide Norfolk sky. Me then, me now. It had been early August 2005 I remembered, a day in that mixed summer of heat and rain and unpredictability. My friend Tom Muckley and I had come here to Wickmere in the late afternoon at the end of two days exploring churches in the area between Cromer and Aylsham; Wickmere was church number 32. One of the great joys of visiting churches in this area is that nearly all of them are open and welcoming to visitors; but St Andrew wasn't then, and it wasn't on a couple of subsequent occasions. It was a shame. There was no keyholder listed, so we peered through the little barred window in the door, but we couldn't see much inside at all. Instead, we wandered in the graveyard, remote at a crossroads with few other buildings in sight. 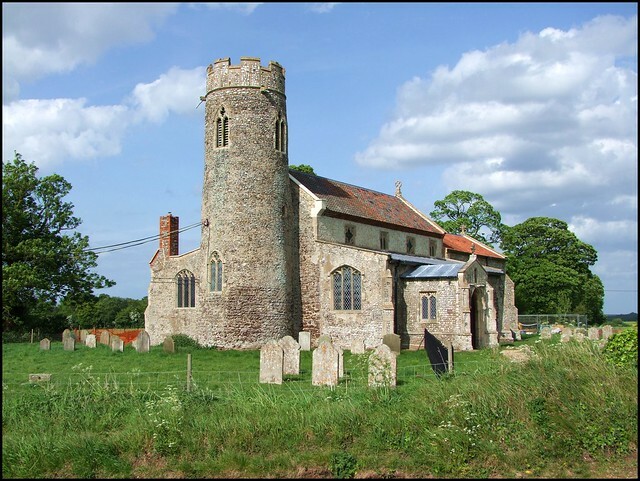 Below its feminine late medieval crown, the narrow round tower begins in a rather austere manner, a little like a chimney of a Cornish tin mine, before tapering towards pretty 14th century bell windows. Now, in 2011, that same tower beckoned across the fields, many already ploughed and drilled as the Norfolk farmers stole a march before the land put itself to sleep for another winter. The hedgerow was full of high grasses, and St Andrew came into view across a field still wearing its barley stubble like an old cloak, still to be drawn back under the ground. I thought of Tom, dead now, his ashes scattered across a Norfolk field like this one. This was my last bike ride in Norfolk of 2011. I was cycling from Cromer to Norwich, to catch the train there back to Ipswich. Not a huge distance, but the pleasant meandering around lanes and the cutting off at tangents to visit churches, most of them old friends, would make it about forty miles all told. It is hard for me now, a couple of months on, to remember quite how warm it was that day, and how humid the air was in the sunken lanes around the Barninghams and the wide park of Wolterton Hall, home of the Walpoles. It was an utter joy to be flying through the landscape on my new bike, a few months old, a drop handle tourer which was still a novelty after years of hybrids. I had not owned a steel touring bike since I was in my twenties, and in truth a feeling of those days came back to me as the wheels spun on their bearings down the narrow Norfolk lanes. And there was an added excitement because I knew that Wickmere church would be open; I had finally got into Aylmerton church earler that day, and so St Andrew, Wickmere, was the very last north Norfolk church which I had not previously seen inside. St Andrew is a church of uncommon interest, and is thanks to the sleeping Earl that it has been preserved for us. An extraordinary war memorial waits just inside the south door, an angel holding a roll. A medival minstrel strums a lute on a bench end, grinning wildly and looking for all the world like a 15th Century George Formby. Two ghosts from a late medieval memorial kneel headless in a window splay. Not only does the screen have Saints in the dado, but two of the panels from the Wolterton screen, depicting donors, are now fixed to the 1930s pulpit. A late 17th Century ledger stone indulges in a rather extraordinary theological debate: But is Gunton dead, what doest thou say? His soul is a live, his body here doth lay but in a sleep until ye Judgement Day, and live he shal until Eternity. Men say he's dead, I say so too, and ere a while they'll say ye same of you. But all around are the Walpoles who came here to rest. A smaller angel in a chancel window splay remembers Horatio Corbin Walpole, born at 15 Grosvenor Square London 9th January 1891, died at Waborne Hall Norfolk 20th May 1893. Poor little Horatio presumably lies in the churchyard, because this is actually a fairly conventional outdoor gravemarker, perhaps brought into the church at the time of the 1930s restoration. As well as the war memorial, St Andrew contains a WWI battlefield grave marker for Horatio Spencer Walpole, a cousin of the Walpoles of Wolterton. He was killed on the Arras front in April 1918, and is buried at Bac de Sud Cemetery near Bailleulval, not far from where he fell. His cross came home to be with the long Walpole generations.